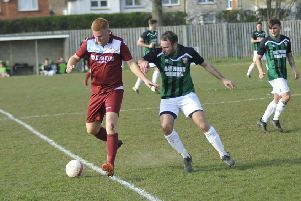 Bexhill United manager Ryan Light lauded an ‘exceptional’ performance after the football club began its league programme with a stunning 7-0 victory. The Pirates scored five goals in the first half en route to a crushing win away to Oakwood in Macron Store Southern Combination Football League Division One on Saturday. On a nice pitch which Light felt suited Bexhill, the visitors made a fast start kicking up the slope and Nathan Lopez opened the scoring with probably the pick of the bunch. Having picked the ball up just inside Oakwood’s half on the left, Lopez went past three players and cut inside before executing a sublime chip over the advancing goalkeeper and into the roof of the net. Drew Greenall, scorer of the winner against Southwick, then made it 2-0. A ball down the middle was flicked on by Gordon Cuddington and Greenall turned neatly on the edge of the box before unleashing a left-foot shot on the angle which flashed across the goalkeeper into the far corner. Number three came from the penalty spot. Greenall got to a throughball just before the goalkeeper and chested it past him only to be cleaned out as he did so. The reliable Craig Ottley tucked away the resulting penalty. The fourth goal was straight off the training ground. Some good, free-flowing football ended with Greenall delivering a cross from the left-hand side of the area for Kevin Barden to score with a fine finish into the top corner. There was still time for one more before the break. A cross from the right dropped in the Oakwood area and Ashley Kidman, playing in a more advanced role this season, reacted quickest to poke the ball under the goalkeeper as he came out. Clearly impressed by what he’d seen from Bexhill, Oakwood’s manager came over to the away dugout at half time, shook the hands of Light and John Masters, and told them ‘that’s the best first half we’ve played against’. Light said to his players at half time ‘the most important thing now is we keep a clean sheet’, and the tempo, workrate and focus remained very good during the second period. Greenall made it 6-0 with his second of the afternoon. Again the forward turned neatly in the box and finished neatly across the goalkeeper via the far post with his left foot. Lopez, who Light described as ‘magnificent again’, completed the rout with another fine goal. A corner was cleared to just outside the box, from where Lopez showed great technique to fire a well-struck shot through a crowd of players into the bottom corner. Bexhill: Rose; Rea, Robertson, McFarlane, Ottley; Holden, Lopez, Cuddington (Giles); Kidman (Gouet), Greenall, Barden (Wheeler). Subs not used: McGuigan, Butchers.